Listen to this article in audio form! It’s #27 on the Barrel Racing Tips podcast. When it comes to training barrel horses, it seems like everything can change when we add the pressure and challenges of competition. If you’ve been barrel racing long enough, you’ve probably had experiences where it seemed like everything felt perfect – until your horse found a few more gears. Or that you could make an awesome run at home, only to have it all fall apart in competition. While some horses have more ability to efficiently maneuver their bodies at speed than others, our job as riders is to help balance out their natural tendencies. We want to polish up what’s good and better develop the weak areas. But what about when we feel like we’ve done EVERYTHING, and things STILL come apart at speed or in competition? With one of my horses in particular, I felt like I had left no stone unturned when it came to developing a foundation that would carry through to our performance on the pattern. But for years, we would miss the mark. It was insanely frustrating! In this article I’d like to share WHY I think things tend to fall apart at speed, as well as how my horses and I have overcome the challenges that speed presents. As with many issues that come up on the pattern, they are often only symptoms of deeper issues. I feel as though understanding the “why” gives us insight into “how” to successfully troubleshoot. I’ll also be sharing a few exercises that have been valuable to me for ensuring there are no disconnects between my horse’s slow work and speed work, that I think will be helpful for you as well. One of the first reasons our runs go downhill at speed is because we, OR our horses, resort to old habits that are not efficient or no longer serve us! Let’s say a horse was initially trained to use follow a certain path or use his body in a certain way on the pattern and it’s become habit, or maybe the rider inadvertently allowed the horse to develop his own (not so efficient) way of moving and didn’t really notice until it became a problem over time. Eventually we realize we need to fix something, but even when we try to retrain the horse, they revert back to those old, known ways of using themselves at speed. 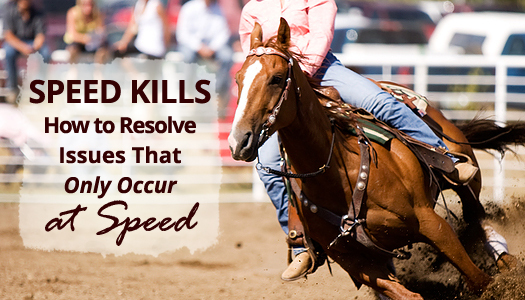 This happens to horses and humans because of how our brains operate. In a high speed run there is little time to think, only react. Establishing new habits takes conscious effort at first. 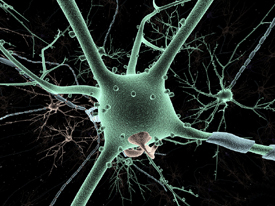 Through careful repetition, new neural pathways can be created that tell our bodies what to do (like muscle memory). Until then however, the neurotransmitters in our brains resort to firing on the pathways that are already well worn – meaning the horse (or human) will fall back in the same “rut” or habit, especially at speed where there’s little time to consciously think about making a change. It certainly doesn’t help our horses when we’re riding them the way we rode a horse we had years ago, or if we constantly forget to sit deep before the turn or have a habit of using our hands erratically, etc. Developing new neural pathways, and therefore new habits as riders is possible, but it’s not necessarily easy. It takes some dedication to overcome ways of doing things that no longer serve us. A second reason our horses are “different” at speed or in competition, is because the WE, as riders, are different at speed/in competition. If you really became aware of how you think/feel/react in an exhibition vs. a competition run, you’ll probably admit that it’s just DIFFERENT. The pressure, the energy, the nerves, etc. What IF you could be the same, mentally cool self in your run as you are in an exhibition? What if you could be the same calm and collected self you are at home as in competition? It IS possible through mental training. We can develop our minds and build our mental muscles just like we build strength at the gym or condition our horse’s muscles. It’s important that we make efforts to master the mental game of competition to ride correctly and consistently under the pressures that speed and competition present. Stiff, resistant, dropping on front without hind end engagement. Again in this area, it also helps to understand what blocks are in the way of mastering our mental game. That’s why I wrote an entire chapter on the “Inner Game of Barrel Racing” in my book “Secrets to Barrel Racing Success.” If you’re serious about getting out of your own way, and clearing a fast track to barrel racing success, check it out! There will always be certain aspects of the exhibition environment vs. the competition environment that you don’t have control over. However, you do have a choice when it comes to BEING the cool, calm, consistent rider your horse needs you to be under any kind of circumstances. Certain things you just can’t change, but improving your ability to mentally focus, block out distractions and get in the zone, whether you’re at a local jackpot or trotting down the alley at the NFR is something you CAN do something about! A third reason a disconnect occurs at speed or in competition is that the mental, emotional, physical and educational foundations are not firmly established. Speed is the most honest communicator we’ll come across. It tattles on us. We can be developing a horse where everything seems to be coming along great, but then the addition of speed reveals “holes” in our horse’s foundation. Issues we may have overlooked suddenly become glaringly obvious! We can have everything PERFECT until speed is added and then suddenly the training we thought was so solid can go right out the window. To achieve success in barrel racing the mental, emotional, physical and educational foundations must be solid under any kind of circumstances. If there are any exceptions to what and when your horse will willing do what you ask, then there is a weak spot in your foundation. If your horse is nervous or distracted, if he refuses at the gate or ignores your cues in a run, etc. then there are areas in the foundation that need to be better developed. There are a lot of solid “well broke” horses out there who are not broke at all – AT SPEED! How round and gathered is your horse as he circles a barrel? As we’re training, it’s easy overlook potential problems developing, or think that little issues that occur away from the pattern don’t relate. If your horse gives you even a little inkling that his foundation is weak in any way, under any circumstance, vow to nip it in the bud instantly! How we do some things, is how we do other things – same for horses. When you see a potential problem area, explore it, dig deep into it, take the time it takes to completely work through with your horse so it doesn’t become an issue. Even if we feel like “we’ve done EVERYTHING!” to ensure our horse has all the necessary pieces in their development to have it all come together on the pattern – if we become REALLY aware, and look deeper, we’ll often find that we really HAVE NOT done everything or that those issues occurring at speed ARE indeed happening in slow work, we just don’t notice it. I guess you could say in this case, that it’s OUR foundation as riders, that needs more development. Figuring out where the weak spots are means developing an open mind, becoming a detective, breaking free of old habits and patterns, and being committed to self-development. Ride with some new friends, watch some DVD’s, have someone you respect and admire ride your horse and see what they feel and or see. You can also enlist the help of a pro, as with my Power Hour Video Coaching. You can’t fix what you can’t see and/or feel. We all get stuck sometimes, it’s our choice whether we STAY STUCK or not! Below I’ve delivered an action plan for closing the gap, and ensuring that your perfect slow work transfers over into perfect runs. 2. Bridging the gap between slow work and speed work. Is your horse balanced in four wheel drive or leaning to the inside? I took action recently and set up TWO barrel patterns in the arena. (Click here for a printable PDF diagram of the “Double Pattern.”) I did so because I had realized that my horse would move with quality around one barrel or two barrels in a figure eight, but when he realized we were doing “THE pattern” the quality of his movement went subtly downhill. I’m sure this was realted to ways in which I had inadvertenly allowed him to move in the past, thus creating a habit. To help my horse establish new, more efficient ways of using his body I had to mix it up, almost fool him into thinking we weren’t doing the pattern (only we were – sometimes), and then just mesh the two until he was moving with quality ON THE PATTERN. Think about the specific issues you have and integrate fixes into this double pattern. On the first barrel, where my horse would lean and get a little strung out, I’ve been stopping and rolling back in the approach, to remind him to square up and not lean to the inside… on the 2nd and 3rd, where he would lean and start turning too soon, I’ve been really reiterating bend, and sometimes counter arcing out, forward and away (with true bend through the rib cage – without this you’ll just create more stiffness). 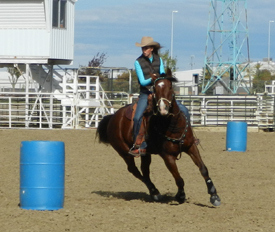 With all these barrels in the arena, I would continuously work around them in all directions, speeds and patterns, while requiring that my horse move with quality at all times. As I was doing so, I’d sneak in the actual barrel pattern. If my horse anticipated and reverted back to his old habits, I would correct the instant the mistake occurred. It was usually at speed when I had to make these corrections (where the bad habits tended to come up more often) and in those moments, it’s not exactly pretty. However, I needed to put a road block in front of those old neural pathways/habits! 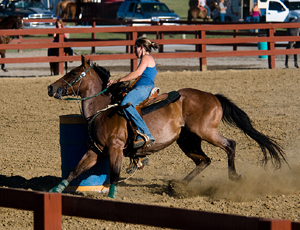 Horses learn good and bad habits through repetition, so every time your horse is allowed to make a wide turn, lean into a barrel, go by, etc. they are just learning to do that even better! 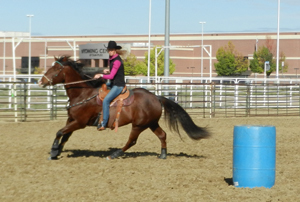 If your horse needs more relaxed, forward movement around the barrel, you might make a circle near the barrel first to get the quality of movement you want, go back to the barrel so they learn that what you’re showing them also applies on the pattern. Do you have elevation and hind end engagement even at speed? One of the keys to success with this “Double Pattern” exercise is that you’ll want to introduce some high end speed as you progress. Remember, you’re working toward closing the gap so your horse doesn’t revert to his old habits in competition. That means turning up the speed to more closely resemble how fast you’d go when competing. I think some problems occur with speed because barrel racers make too big of a jump from a high lope to mach 10, while never testing the gears in between. Also keep in mind that if your horse has spent years establishing the habits he currently has, that completely changing them doesn’t happen overnight. It usually takes 4 – 7 days for a horse to learn a new “pattern,” but completely reprogramming their muscle memory so that it holds up at speed can take a month or more. Be patient and don’t hesitate to enter once you’re confident you’re headed in the right direction. It’s a good idea to “test” what you’re doing, because unfortunately it’s possible to inadvertently create a new set of problems when you’re trying to fix others! I hope this article helps shed some light into solving the frustrating problems that only seem to come up with speed. In the comments below, feel free to share what your challenges are at speed or any insights for fixing these issues that have proved helpful for you! Here’s that link again to the downloadable “Double Pattern” exercise! I actually don’t have an arena at home either, the closest thing I’ve had to an arena was a plowed up corner of pasture for a couple years when I was 12-13 years old! 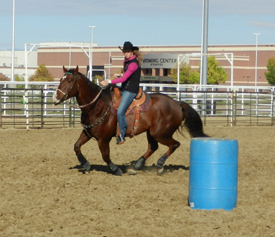 So you can definately train a barrel horse without an arena! These days, I haul to an arena a couple times a week, I also have access to one that’s within riding distance from home. What I’d recommend for you is to get your pattern perfect going slow in your grassy area. In the round pen work on quality circles, with bend, collection and impulsion. Perfect circles are so critical! You might also work on rate, get your horse responding to your body language the instant you sit down and ask him to transition down and up in gait or stop. Then I’d recommend doing what you can to get to an actual arena with good footing and some distractions to put it all together and test the fundamental’s you’re establishing at home. I’m sure you can do well with what you have, it’s not about your resources, it’s about your resourcefulness! Good luck! My sister and I both haves horses that don’t sit down and engage there hind end around the barrel. We don’t know what to do to help make them do this correctly! Thanks for your question. Part of the challenge is realizing that your horse isn’t using himself in a way that is efficient, so give yourselves some credit for that! 🙂 Click here for a past Q&A on achieving smooth, balanced, fast turns – I think it will be helpful. Also, next week I’ll be sharing some exercises via email that are great for getting a horse to use their hind end, so stay tuned! If you’re not receiving the weekly winning tips yet, click here to sign up. Hi Heather, I have a question. My mare is fast and yes her mistakes are when we go fast, she wants to fly and her head comes up and i loose control,we put a tie down on her, it helped some and she gives nice in the face even when i breeze her. She has had her teeth done. But she will still try to take her face away when we get on the pattern. Any advice would be great,.Someone tpld me to bit her up and make her go forward, would that help???? Thanks. Cases like this can be a little complicated, there are usually several layers to the problem. So many times in the past, I have thought I had my horses foundations very well established, but when things would fall apart on the pattern or with speed, this basically told me that our foundations weren’t firm enough if they don’t hold up under those circumstances. Chances are good your horse needs #1. Even more refined education to lower her nose and give softly to bit pressure (under all circumstances), #2. Some mental/emotional rehabilitation and adequate leadership to help resolve the CORE REASON her head comes up (which could have more to do with getting amped up/emotinally unbalanced when it’s time to run), #3. A strategy for interrupting what has become a habit… you might try an exhibition and when her nose comes up just stop what you’re doing and bend her side to side to remind her to soften and come back to you, and maybe even circle her a few times, so that she learns that putting her nose up will result in some discomfort. Make the right thing easy and the wrong thing difficult. Tie downs can be good for masking symptoms, but that’s not really what you want in the long run. 🙂 You want to be completely thorough about going through the three steps I mentioned above to resolve the issue completely. I’m not a big fan of bitting a horse up, I lean more toward good education, and “hands of steel in velvet gloves,” to educate my horses rather than mechanical means. When you apply pressure and release with appropriate timing, it’s amazing how fast they learn! Hope that helps! Hi I have a mare who love to run but when it comes to the barrel pattern she trots and canters it fine, but when it comes down to running it seems like she is just running crazy and when I sit and ask her to turn her first barrel she blows off the back of it and stalls and I am confused by this because she does it perfect at lower speeds. This confuses me because she knows the pattern but when I ask her for speed it’s like nothing else matters but running as fast as she can in a straight line. She was never on the track so I don’t understand where this habit is from. You might try “testing” your horse by loping the pattern while having a super soft feel on the reins, so soft that it’s almost like you’re not even holding them. If she doesn’t stay on track, then she may need more “independence on the pattern.” (See our FREE Guide with Kay Blandford for more on that) Also, I’ll add a couple links below to past articles/Q&A’s on body language and getting connected. In addition, keep in mind that horses often have a hard time separating an increase in speed with an increase in emotions, which is why we have to be very intentional about providing leadership, building their confidence and emotional fitness. Usually when things fall apart at speed, there has been something missing all along, it just becomes more obvious at speed, so keep looking. Also, don’t rule out soreness, a good thorough exam by an equine performance Vet. is a good idea! Hi i have a 15 year old all around rodeo horse.He does great him every event going slow but when i try to push him in the arena he acts like he dont know whats going on.He is one very fast horse and has the speed. I have only been rodeo for about 2 years and he is my first rodeo horse. I have a 4 day rodeo coming up in March 2013 and i need him acting right before then. Hi, I have a 12 soon to be 13 year old gelding who stands 15’2 and 1/2, he always engages all the right spots (hips, head flex etc) when we turn and our normal constant time is a 16.4, we have technique down perfect but as you mentioned theres a problem that only occurs at speed. Yesterday we took the speed up by a lot, so we came into the turn right but we came out wide on that first barrel and almost the same on the second, the third was almost perfect tho and we didn’t knock down any barrels. He’s a free runner so it doesn’t take much to get him to go but the issue is he comes off wide on that first and second. This never happens at our old running speed but it only occurs when we try to take our time to the 15’s. He flexes great, I have no problems controlling his front or hips, and he listen very well, I also help him out by using two hands and a lot of foot work to communicate with him until he master his turns again at this new speed. He has the talent and he wants to win as much as I but what can we do to solve the ending with wide turns? You might take a look at this past Q&A for “Fixing Wide Turns,” here’s the link. A always figure that when something falls apart at speed, that just tells us that it’s something isn’t quite good enough going slow. Even though it may seem fine going slow, we have to look deeper – for example, ask yourhorse – is your horse a nervous type? Is the added speed getting him unbalanced emotionally? Or does he not have the education and independence instilled to take responsibility for staying on track with only subtle guidance from you? Does he lack responsiveness when you try to move him over at speed? Do you think his way of running has become a well established habit and he just reverts to it at speed despite the training you’ve done in slow work? You might also set up a thorough lameness exam with a good equine performance Vet. to rule out a physical problem that could be causing some soreness. You might also really study your riding in slow motion, are you asking him to finish the turn with your body more than your hands? I think you’re looking in the right areas, you might just need to look more closely to get to the bottom of this one! Hello, I really need some help I have a 13 year old quarter horse mare she has recently picked up a bad habit coming off her first and second barrel she tres to run back to the gate at home she is fine but when she gets in a ring she goes all to pieces she gets very nervous before she eats near or even sees a ring. is there any tips or exercises I can do to help her feel more comfortable in a ring and to help me fix her barrel problem? Hi, I have a mare that is super fast off the pattern, but I just can’t get her to run on the pattern. Our runs are decent (just lacking speed), and she lopes and trots the pattern perfectly. How can I get her to use her speed to her full potential? Hi,my horse is really good on the pattern it’s just when I’m running home she carries her head down and doesn’t run fast enough. Hi Ashton, you might do a search for “whoa and go” in the upper right corner and also check out the Speed Guide that comes with Secrets to Barrel Racing Success! Hello! My mare has gotten into this horrid habit of running off to the side on the first barrel, bending her body and pretty much side passing at a run! She won’t do it at home in my arena much, and she’ll only do it when I add speed and kick her up. The times she has done it at home I stop her, back her up back to the barrel and correct her by doing circles around it and keeping her collected. She’s pretty much learned not to do it at home now, but she’ll still do it when I take her out to exhibitions, and I usually don’t have enough runs to really fix it at that certain arena. Do you have any tips on exercises I can do at home to help prevent this? It won’t ever happen on any other barrel, and she won’t do it every time. She seems to know when I’m competing and when I’m practicing! I have a mare that just started competing this year. She wants to run. But it’s like she anticipates the 1st barrel sooo much that as soon as she gets past the alley she wants to run straight to the fence. (she goes left first). But not after the barrel. LIke 30 feet in front of the barrel. I try to hold her straight and kick her with my left leg, but she ends up with her head facing 2nd and it’s of course slowing us down all the way. Any thoughts? Hello i have a mare that is a very hot mare. She was a reject reining horse and they fought a lot on the right side. When I work her its very slow and out of the arena. She is light moves off your legs. she is great! recently we have been skyrocketing from 3d to 1d in a matter of a few months. when she gained speed she got to bracing in her ribs and lead with her shoulder. she is so athletic she can whip around a barrel with her nose pulled off. this only happens at speed. i wonder what i could start doing to help.